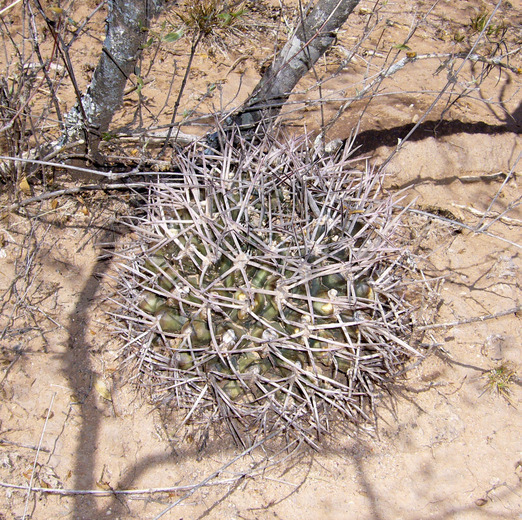 Echinopsis leucantha is a species of plant in the family cacti, with a self-supporting growth habit. It is a photoautotroph. Definition: Crassulacean acid metabolism. A carbon fixation pathway that evolved in some plants as an adaptation to arid conditions. In a plant using full CAM, the stomata in the leaves remain shut during the day to reduce evapotranspiration, but open at night to collect carbon dioxide (CO2). The CO2 is stored as the four-carbon acid malate in vacuoles at night, and then in the daytime, the malate is transported to chloroplasts where it is converted back to CO2, which is then used during photosynthesis.